To qualify, cats need to be streetwise and able to hold a crouched position for long periods of time. A hunting instinct is important, along with being able to navigate in the dark. Only well groomed, whiskered individuals need apply. A permanent residential address is not a necessity but the confidence to pose for the press is a must. Munich Mouser was the right hand cat for both Neville Chamberlain and Winston Churchill during their respective periods of office in Downing Street. He lived through the bombing raids of London during the Second World War, silently going about his business, keeping the rats in check. Petra, a slinky female was already in position when Edward Heath moved into Downing Street during 1970. She passed away in 1973. In 1973 Wilberforce took on the mantel of Chief mouser. He went on to serve four different Prime Ministers, including the Iron Lady herself. It’s rumoured, after a trip to Russia, Margaret Thatcher came back to London with a tin of Sardines for her faithful feline. On the death of Wilberforce in 1987, Humphrey, a handsome black and white stray off the streets of London took on the role. Controversy dogged his time in office. Questions were asked over the untimely death of four young Robins outside the Prime Minister’s office window. John Major was quick to jump to his defence, indicating they died of natural causes and that ‘Humphrey had been falsely accused’. He was also linked to the unfortunate incident of a dead duck in St James’s Park in 1994, having fled the scene. In 1995, Humphrey went absent without leave, taking up temporary residence at the Royal Army Medical College. Known as ‘Patrol Cat’ he continued his under cover work, until being discovered by the Press and reinstated at Downing Street. Humphrey remained at post for just six months after Tony Blair came to power. Then, one day in November 1997, he disappeared once more. There were rumours about a breakdown in relations with Cherie Blair, catnapping and murder. These were put to rest when it was announced the elderly mouser had elected to retire quietly to the suburbs on health grounds. He reportedly died in 2006. As a result of Humphrey’s departure, there were some large paw prints to fill, which were briefly tried out for size in 2007 when Sybil moved to town. Brought from Edinburgh by Alistair Darling, the then Chancellor of the Exchequer, her term of public duty lasted just six months, before the bright lights of the city became too much. She returned gratefully to her native Scotland. In 2011, rats were spotted scurrying around the ankles of the press, so Larry the Chief Mouse Catcher was introduced to Downing Street and the Cameron family. Having come from Battersea Dogs and Cats Home, this four-year-old tabby has been serving his country by patrolling the corridors of power ever since. 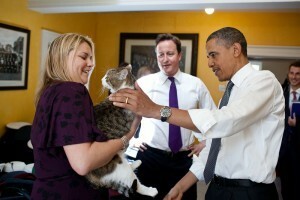 With the election looming, it’ll be interesting to see if Larry remains in his purr-fect job. Keep your paws crossed!